The wedge play in youth football is a very powerful play! This season was the first time I’ve ever ran the QB wedge play. I always felt like it didn’t fit into our wing t offense, but I was clearly mistaken. It has been one of our better plays this season. Especially since we run so much jet and rocket stuff, the wedge off of jet killed defenses. We would hit defenses off tackle and outside and once they widened, we’d killed them with wedge. We decided to get away from our tackle trap play and implement the wedge play as our primary interior play. 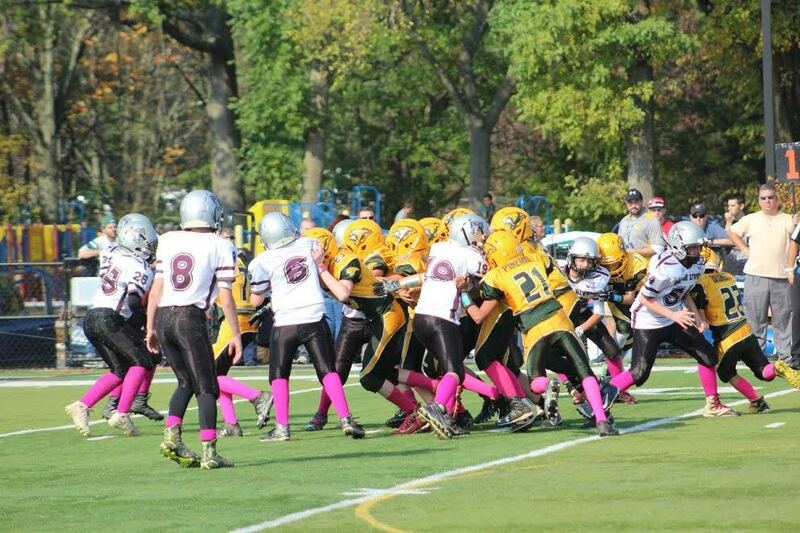 The wedge play in youth football is an underrated and under utilized football play. The wedge play is easy to install and is essentially a play that has 6 or more blockers vs. one defender. It generates so much force it literally plows through defenders. The only hope for the defense is to cut the wedge down. It’s actually a pretty deceptive play. I’ve notice on film that defenders have no clue where the ball carrier is. Wedge is something we practice every single practice. We will work a lot on wedge in our individual position sessions. We will always wedge the center, we don’t wedge a particular defender. 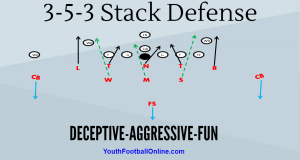 This applies more so for double A-gap defenses. When we are facing a team with a NT, then we will wedge the nose. We cheat our splits down to 1/2 foot. Defenses will notice that we cheat our splits down when we run wedge, which is fine. We can run every other play out of our offense with 1/2 foot splits. So once they shift down based on splits, we’ll run jet with 1/2 foot splits. The offensive linemen (TE, Ts, Gs, and WB) have to take an inside step and press on the linemen inside of them. Ear hole right on the hip/rib cage of the offensive linemen inside of them. They then put their inside hand on the lower back of the the linemen and push. The shoulder pads should be in the rib cage of the linemen inside of them, hand should be on the back pushing as well. Taking that first inside leverage step is critical. The guards take inside step first, ear hole on the center, and the two guards get hip to hip and drive the center. It’s like a double team block on the center. The center needs to keep his feet under him. You want the center to sink his hips and sky his eyes. If the center loses balance he will fall and the wedge will collapse. You want the center to get his hands under the NT. He must keep his feet under him. If the wedge starts to collapse, the ball carrier needs to get out of the wedge and get into the open field. We run wedge with our QB. The QB will be the ball carrier and he will step back with his motion side foot, give a half fake to the jet motion player flying by and then he will get into the wedge behind the the two guards that are hip to hip. The jet motion player must fake jet sweep. You have to sell jet sweep. The timing of the snap needs to be the same as jet sweep. It is important that you teach your players to keep choppy steps and low pad & hip level so they can absorb the defenders that try to cut down the wedge. If they want to cut the wedge, they are going to get stepped on. The team we played in the league championship this year did a decent job of stopping our wedge. However, we still had a lot of success with it. We hit a 50 yard TD run with our wedge. The team showed us double A-gap defenders. They both were pretty big players and they would cut down the wedge by throwing themselves at the legs of our guards and center. If teams want to commit to stopping the wedge that is fine. If the defense commits to stopping our QB wedge, they will open themselves up for other plays off-tackle or outside. As the wedge begins to collapse or separate the ball carrier needs to find day light and score. Once the wedge breaks down the OL must pick a defender and block them. This was the first year we ever ran wedge and I plan on educating myself more so on the wedge this off-season. I have a few friends that are double wing and single wing coaches that absolutely love the wedge play. They have been telling me to run it for years. We installed it half way through the season this year, but going forward this will be one of the first plays we install. I’m now on the wedge bandwagon. If you have any coaching points for the wedge play please leave a comments. I would love to hear your thoughts on the wedge play in youth football.